In Switzerland, pension fund assets can be used to purchase a home. There are two options: advance withdrawal and pledging. Learn about the differences, and see the best option for your situation. When buying real estate, you must generally finance at least 20 percent from your own assets. To provide the equity, you can use money from your pension fund under the WEF home ownership promotion program. You can either make an advance withdrawal or pledge the funds. To be eligible, the property must be used as your own residence. However, you still need some money of your own: At least 10% of the purchase price must be from liquid assets, such as savings or gifts. Many people are unaware that pension fund assets can be used not only to buy residential property, but also to renovate their own home or to repay their mortgage. 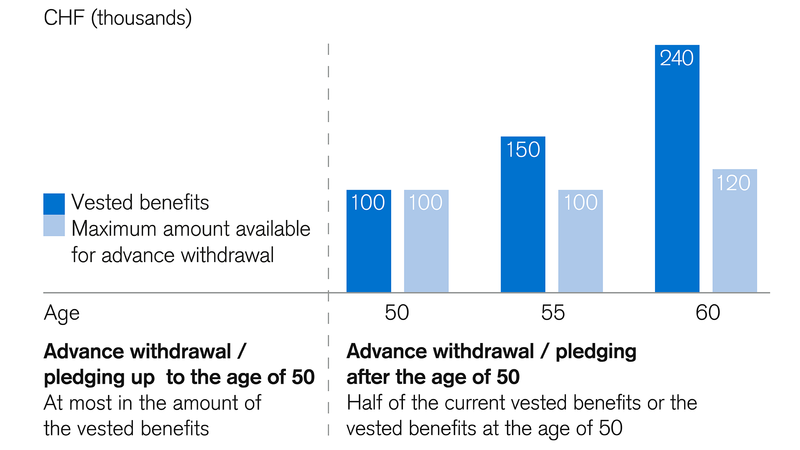 You can generally use the entire vested benefit until age 50. Later, you can buy a home using either the balance that was in your pension fund until you reached age 50, or half of the current balance, whichever is higher. Advance withdrawals and pledging are generally permitted up to three years before normal retirement. Pension funds can stipulate otherwise in their regulations, however. Until age 50, the entire vested benefits of CHF 100,000 can be used. At age 55, the pension fund has a balance of CHF 150,000. Instead of half the current balance (CHF 75,000), up to CHF 100,000 (balance up to age 50) can be used. At age 60, the pension fund balance is CHF 240,000. Half of this, meaning CHF 120,000, can be withdrawn prematurely or pledged to buy your own home. An advance withdrawal of assets from the pension fund frees up more equity capital. This not only makes it easier to finance your own home, but also means that you can reduce your mortgage. This in turn means less mortgage interest. However, if you make an advance withdrawal you will have a pension gap. For this reason, you should repay the amount withdrawn in advance before you retire or find a private pension solution to bridge the gap. Otherwise, the pension fund will pay out lower benefits on retirement. Depending on the pension fund, there may even be lower benefits for disability, or lower survivors' benefits in the event of death. Anyone withdrawing money early from their pension fund should therefore check with a specialist whether any gaps will arise in the pension provision and how these could best be closed. Using your pension fund to buy your own home: Points to keep in mind. You can make an advance withdrawal of retirement benefits for your own home every five years; the withdrawal must be at least CHF 20,000. Any repayments to the pension fund must be at least CHF 10,000 and can generally be made up to three years before you retire, unless otherwise stipulated by your pension fund's regulations. The amount withdrawn from the pension fund in advance will be taxed at a reduced rate, separately from your other income. These taxes cannot be paid using the sum withdrawn. If you repay the money to the pension fund at a later date, you can also request a tax reimbursement but will not receive interest. Once you make an advance withdrawal from the pension fund, you cannot make tax-deductible, voluntary purchases of 2nd pillar benefits until you have repaid the advance withdrawal in full. The amount withdrawn in advance must also be repaid in full to the pension fund if you sell your own home. Instead of taking the capital from your pension fund, you can also pledge the pension fund assets. In this case, you would pledge the pension assets to the bank, which increases the mortgage amount by the amount pledged. This gives you additional borrowed capital for the purchase of residential property. The conditions for pledging are similar to those of advance withdrawal. However, when you pledge the assets, they stay in the pension fund, which allows you to keep insurance coverage and retirement benefits. There are no taxes for withdrawing these funds, either, because the money is only collateral for the bank that it can access if needed. The pledge is governed by a special pledge agreement. Because the mortgage amount increases, there is higher mortgage interest in the event of a pledge. However, the borrowers benefit from tax advantages. Whether you opt for advance withdrawal or pledging, it's best to get in touch with the pension fund as soon as possible in both cases. Pension funds can defer the advance withdrawal by up to six months. In the event of a shortfall, the waiting time may be even longer. A shortfall means that the insurance company does not have enough money to cover the insurance benefits promised. In some cases, the pension fund can even deny the request for an advance withdrawal or pledge. Before you take money from the pension fund to buy your own home, be sure to obtain a professional consultation so that you do not have pension coverage gaps upon retirement. It is important to cover any losses in the pension fund in good time. Interested in using the pension fund to finance your own home? We'll be happy to advise you.